There are some pieces of pop culture that simply define a generation. Beatlemania, Michael Jackson, Scooby-Doo, Star Wars: these are the massive media events that still resonate with baby boomers and their babies today. Ask anyone over the age of forty about Star Wars and they will most likely describe to you— in florid detail— the day they saw the first film in theaters. Generation X and my own Generation (I have yet to find a term for it that isn't hypercritical) have our own pop culture legends: Harry Potter, Pokemon, and, of course, Spongebob Squarepants. For as long as I can remember, that buoyant, sunny little sponge has been a part of my life and that of my peers. Will Spongebob's latest outing do its extensive legacy justice? 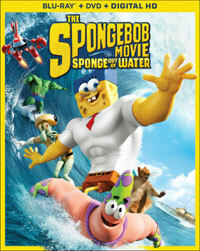 The film opens with a pirate named Burger-Beard (Antonio Banderas) traversing a booby-trapped island in order to obtain a mysterious book that describes the present escapades of the Bikini Bottom gang. We dive deep below his ship to find the Krusty Krab under siege by Plankton (Mr. Lawrence), who has been struggling to steal the secret formula for the Krabby Patty, the restaurant's widely-loved staple. Plankton is intercepted by fry cook Spongebob (Tom Kenny), restaurant owner Mr. Krabs (Clancy Brown), Spongebob's dimwitted starfish friend Patrick (Bill Fagerbakke), pretentious musician Squidward (Rodger Bumpass), and genius underwater squirrel Sandy (Carolyn Lawrence). However, things go bad when the formula suddenly disappears and the town, blaming Plankton, descends into post-apocalyptic chaos. Spongebob believes Plankton is innocent, so the two team up and build a time machine in order to prevent the formula from disappearing. Along the way, they befriend a time god dolphin named Bubbles (Matt Berry), who grants Spongebob and the gang with the ability to breathe air so they can go to the surface and find the formula. Up on dry land, Spongebob and his friends have to defeat Burger-Beard and his magic book in order to rescue the formula and save Bikini Bottom once and for all. Sponge Out of Water bears the mark of a recent trend in animated movies: poor advertising. Most trailers and commercials marketed this movie as a purely CGI/live-action romp, littered with bad puns and superhero endeavors. However, unlike other victims of this marketing trend (Paddington and Mr. Peabody and Sherman are the first that come to mind), Sponge Out of Water had no trouble grossing a hearty 311.6 million at the box office. This is, of course, due to the show's popularity and the sheer proliferation of Spongebob in the media. I'm sure the reluctant parents who dragged hoards of excited grade-school kids out to the theater were pleasantly surprised to find that the movie was far better than what was showcased in its badly-edited trailers. First of all, the film doesn't hit dry land until the one hour mark and only spends about thirty minutes in this world (this third act is the weakest of the movie, though). Prior to that, we get a generous helping of what makes the show such a giddy experience. Subtle gags, kinetic animation, and surprisingly clever dialogue make the first hour a delightful ride. Fans of the show will get some blink-and-you'll-miss-it references and children will be exhilarated by the sight of their heroes on the big screen. What distinguishes Sponge Out of Water from the better first film is story. Whereas The Spongebob Movie was an exciting and surprisingly thoughtful mediation on growing up and being able to retain childlike wonder while handling new responsibilities, Sponge Out of Water is both too scattered and too pedestrian. How many episodes have seen Plankton attempting to make off with the Krabby Patty formula? How many times has the Krusty Krab been thrust into jeopardy, only to have Spongebob save the day? Simultaneously, the whole Burger-Beard plotline is just a little too bizarre and tedious to be very entertaining (and it left me hoping Antonio got a hefty paycheck for his embarrassingly committed performance). Spongebob Squarepants is famous for being surreal and odd in its own charming way, but this is too much even for the super fans. That aside, the movie is still a solid effort. The show has been seeing a steady decline recently as storyline after storyline is recycled and the characters border on misshapen Cronenbergs of what they used to be. However, it has been rumored that original show creator Stephen Hillenburg will be returning for the next round of episodes, which might mean a more triumphant return to the small screen that what was offered here. Still, if you're in for a visual feast of crisp and beautiful animation (as well as some live-action shots that must have been breathtaking in 3D), some clever humor, and a palette-piquing mesh of story and character, then it's time to hop on the deck and flub like a fish. The SpongeBob Movie: Sponge Out of Water has the nerve to name a character Burger Beard on Blu-ray Disc courtesy of Paramount Home Entertainment. The film has been letterboxed at 1.78:1 and the Disc contains an AVC 1080p HD transfer which runs at an average of 34 Mbps. The image is incredibly sharp and clear, showing no grain and no defects from the source materials. Those familiar with the TV show will immediately recognize the added depth and detail to the animation here and it really comes through in this transfer. The colors look fantastic and there is no bleeding of the tones. The image is never overly dark or bright. This 2D version still shows impressive depth and the live-action sequences are very impressive. The Disc carries a DTS-HD Master Audio 5.1 track which runs at 48 kHz and an average of 4.0 Mbps. The track provides clear dialogue and sound effects. This is a lively track which provides notable subwoofer action. The stereo effects show good separation and the surround sound effects offer detailed, individual sounds. The SpongeBob Movie: Sponge Out of Water Blu-ray Disc contains a treasure chest of extras. (Actually, it's a surprising amount of extras for a movie based on a TV show.) These are divided into categories. "On the Surface" kicks off with "SpongeBob SquarePants: Out of His World" (8 minutes) is a general overview of the film, offering comments from the creative team and the vocal actors, who discuss the story and the challenge of bringing the characters to our world. "When I Grow Up, I Want to Make Funny Sounds" (10 minutes) focuses on the voice actors, allowing them to speak briefly about their craft and showing them at work in the recording studio. "Becoming Burger Beard" (6 minutes) contains comments from Antonio Banderas and shows how costuming and makeup went into helping him to become the character. "Making the Burger Mobile Chase Sequence" (6 minutes) shows how live action and visual effects were combined to create the real-world action sequence. We see storyboards, pre-viz, and layering effects. "It's Hip to be SquarePants" (4 minutes) is a faux piece showing a fashion designer who makes real square pants. "A Day in the Life of a Sponge" (3 minutes) is a parody of a French film showing an actual sponge making its way through the day. "Underwater Awesomeness" begins with "Plankton Rules the World!" (6 minutes) has real-life biologist Dr. Sylvia Earle teaching us about plankton, complete with footage of real plankton. Dr. Earle returns in "Bikini Bottom Confidential: Rock Stars of the Sea" (9 minutes) where she introduces us to other scientists who study ocean creatures. "International Sponge of Mystery" (5 minutes) offers two scenes, "Meeting Bubbles" and "The Speech" in various languages. "Bikini Bottom Boogie" opens with "Thanks Gosh It's Monday" (3 minutes) has SpongeBob singing a song about how happy he is to be back at work. "SpongeBob Sing-Alongs" offers karaoke-like lyrics for three songs, "Thanks Gosh It's Monday", "Teamwork" and "Theme Song/Rap Battle". We get the MUSIC VIDEO for the song "Squeeze Me" by N.E.R.D. The Disc contains fourteen DELETED/EXTENDED/ALTERNATE/TEST SCENES which run about 26 minutes.